Celebrating the life of Thomas Junious, Jr.
Obituary for Thomas Junious, Jr.
On Saturday, November 24, 2018, Thomas Junious, Jr. departed this life at the WJB Dorn Medical Center in Columbia. 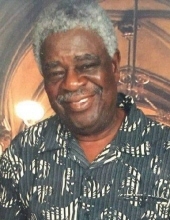 Born on February 22,1947 in Summerton, he was a son of the late Elijah & Minnie Ida Gipson Junious. Service of remembrance will take place on Thursday, November 29, 2018, @ 12:00noon from the St. Phillip R.M.U.E. Church, 4574 Old River Rd., Pinewood, where the Pastor, the Rev. Powell Hampton, will bring words of hope. The service of committal will follow in the family plot located in the St. Phillip R. M. U. E. Cemetery. The family is receiving relatives and friends at his residence, 2307 Lillie Martin Rd., Summerton. To send flowers or a remembrance gift to the family of Thomas Junious, Jr., please visit our Tribute Store. "Email Address" would like to share the life celebration of Thomas Junious, Jr.. Click on the "link" to go to share a favorite memory or leave a condolence message for the family.